Oh Trend..Where For Art Thou? Forget about the lazy days of summer. Violent price declines in global financial markets have investors on edge. As of Monday August 8th, the S&P 500 has declined more than -13% in the first 6 trading days of the month, taking the S&P negative more than -11% for the year. Anchor Capital’s Absolute Return strategies have remained hedged and/or net short during this decline, with several strategies positive on the month in the face of record declines. More on those records later. Here is a brief overview of current markets, and where we see opportunity. On Friday, August 5th 2011 Standard & Poor’s downgraded U.S. treasuries from AAA to AA. The reasons for the downgrade go beyond S&P’s analysis of America’s ability to pay its lenders, including the political stalemate in Washington over budget deficits and spending. The timing of S&P’s announcement could not have been worse. The downgrade was bad news delivered to an already un-easy market distressed over the continuing European debt crisis and a slowing US economy. We have detailed extensively evidence of the weakening U.S. economy and European debt issues in recent Anchor Strategic Insights newsletters, so we won’t rehash them here. (Read the July issue of Anchor Strategic Insights by contacting us here.) Now add a cascade of uncertainty to the markets without the support of QEII and you have the catalyst for extreme markets. Let’s take a step back for a moment and reflect. In March of 2009 the financial world was priced for Armageddon. 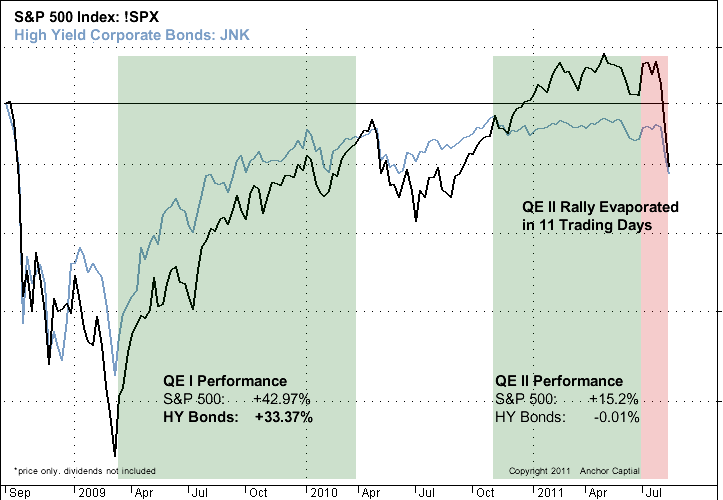 U.S. banks were insolvent, yields on corporate high yield bonds were near 18% and the S&P 500 was 670. The Federal Reserve had already reduced interest rates to zero. In order to provide further stimulus and create the “effect” of interest rates below zero, the Fed instituted its now infamous “Quantitative Easing” program, injecting billions of dollars into financial markets. The objective was to re-liquefy banks, calm markets, and jolt the economy– and most importantly jobs and Real Estate back to life. The Fed implemented two rounds of Quantitative Easing, each with questionable results. The first round of Quantitative Easing (QE I) provided a floor for financial markets, stabilized fears and helped usher in a broad fixed income and stock market rally. QE II had the same positive albeit muted influence on stocks, but absolutely zero impact on corporate bonds and the broad economy. Neither round of QE produced a substantial increase in GDP, improvement in housing or the ultimate goal of job growth. Here is the problem with stimulus that is based solely on liquidity. Liquidity injections are akin to a shot of adrenaline for the patient in the ambulance. It serves to keep the system working, but does nothing to heal and repair underlying injuries. While the Party Raged on, Clouds Where Gathering. 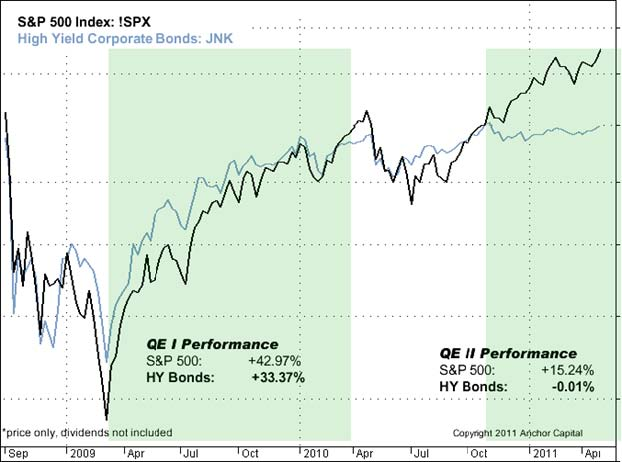 We have been commenting for the past several months on the growing divergence between corporate bonds and equities- a strong warning sign of the growing fragility of the stock market. While stocks have benefited from the record amount of stimulus provided through QE II, corporate credit has not. As the bond market tends to be a better leading indicator of the economy then stocks, this represented a significant warning sign that the past two quarters of stock market performance was based on little more than Federal Reserve liquidity efforts. QE I compared to QE II. A lack of risk aversion does not necessarily mean a market decline is imminent. Low volatility price action can persist for months. But our models were illuminating and environment that was ill prepared for a change in the headlines, the type of climate that usually results in rapid price declines when market shocks occur. And decline it did. Below is the same chart updated through this week. In Just 37 days the market has given back what took 10 months and $600 Billion in borrowed capital spent by the Fed purchasing our own securities to create. Housing is at a new recession low, and the jobless rate is still north of 9%. So much for QE II. Let me attempt to be the voice of reason. Market declines are a normal, and dare I say important part of the investment process. Market shocks result in too much fear creating deeply discounted buying opportunities. Those buying opportunities eventually morph into rising prices, and terminate when euphoria abounds and there is no respect for risk. The cycle repeats. We’ve said it many times: Headlines Change, but Investor Behavior is Predictable. The current decline has broken records for severity, with selling pressure not seen since the 1930s. Quite simply, it is overdone. Markets are due for a return to more normalized prices even if only for a temporary reprieve. Whether that marks the end of the selling for now or there is more work to do on the downside, time will tell. In either case our view is that the environment will continue to favor more actively managed strategies, especially those with an absolute return focus.